An entertaining illusion where fruit combines to form a person. The idea of individual things combining to form something entirely different – like oranges and pears making a face – was a popular idea in European art. 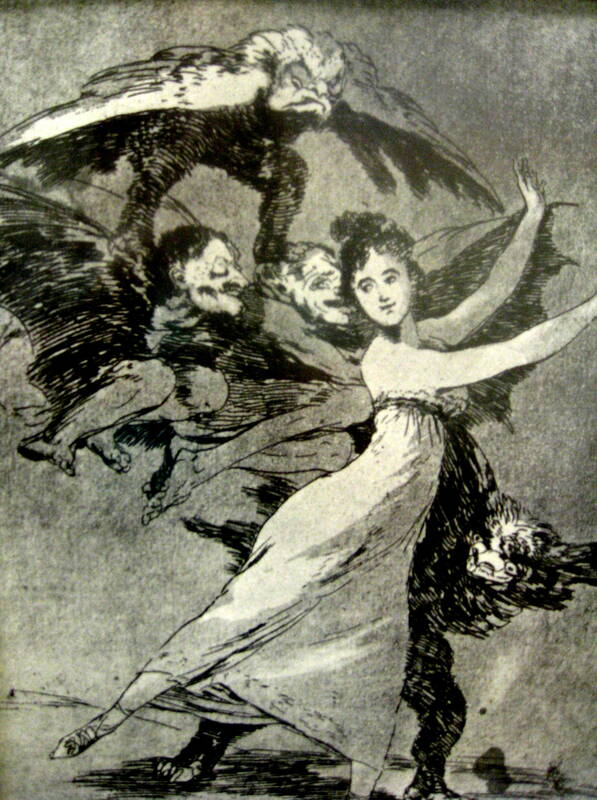 A fantastical, haunting etching seen as a precursor to the work of contemporary artists, such as Tim Burton. 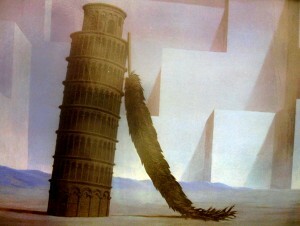 Can you imagine how heavy a feather would have to be to hold up the Tower of Pisa? Or what kind of bird that feather would come from? This strangely fascinating hybrid figure was a favorite subject for this artist. Compare the STYLES of the various artists of the packet. Define the STYLE terms FOLK ART, ABSTRACT, REALISM, and EXPRESSIONISM. People and Dog in the Sun and Twittering Machine are both pictures filled with LINE. Define and discuss both LINE TYPE (5 Basic—horizontal, vertical, diagonal, curved, and zig zag) and LINE QUALITY (describes line appearance—wide, thin, crooked, straight, etc.). Between these two pictures, it is easy to find examples of all 5 basic LINE TYPES. Try to review these two terms with a question or two each month, until you are sure kids are familiar with both the definition and the terms. COLOR is fun and unusual for many of the pictures of this packet, however, a color wheel is not recommended this month. The topic of the packet gives kids a chance to stretch their imaginations. Let them have fun and do a crazy or wildly imaginative project of some kind. Make believe pictures are good inspiration for stories that can be displayed beneath them. Teachers are often willing to find time for kids to create stories that can accompany their imaginative pictures. Help kids realize that a picture does not need to look exactly like real life to be enjoyable and artistic. Discuss how artists are free to change REALISTIC colors to EXPRESSIONISTIC and crazy ones, if they choose. 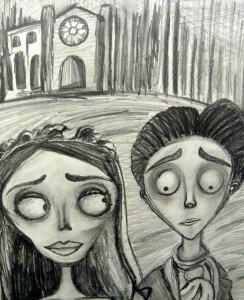 Be sure kids realize that “good” art does not have to be realistic. Discuss how changing SHAPE, LINE, or COLOR can change the STYLE of art to an ABSTRACT work. Make it clear that artists can also change these same basic elements (shape, line, or color) in an artwork and still create a REALISTIC work of art. Edward Hicks was born in 1780, in Bucks County, Pennsylvania where he spent most of his life. Hicks began practicing art as a trade by painting and decorating coaches and signs. An active Quaker, he was a leader in his community and gave much of his time to painting religious scenes. Edward Hicks’ Peaceable Kingdom (of which there are over 100 versions) is his most successful work of art. Do you think this quote is a good description of PEACE? Edward Hicks had probably never seen a lion or a leopard in his life. Even the familiar animals look different. Yet, there is something delightful about these solemn, wide-eyed creatures. Are the animals REALISTIC or EXPRESSIONISTIC? Expressionistic, they do not look like a photograph of the real animals. What type of feeling or MOOD do you get from this painting? What can you see in the BACKGROUND of the picture? Hicks copied (in reverse) a scene from a famous painting by Benjamin West, illustrating William Penn making a treaty with the Indians for the land on which Philadelphia was to be built. Penn, who had a good relationship with the local Indians, won their enduring goodwill, along with the land to build his “city of brotherly love”—Philadelphia, Pennsylvania. Why do you think the artist painted the William Penn scene in this picture? William Penn did not fight the Indians to get them to allow him to build his city. He had a peaceful relationship with them. 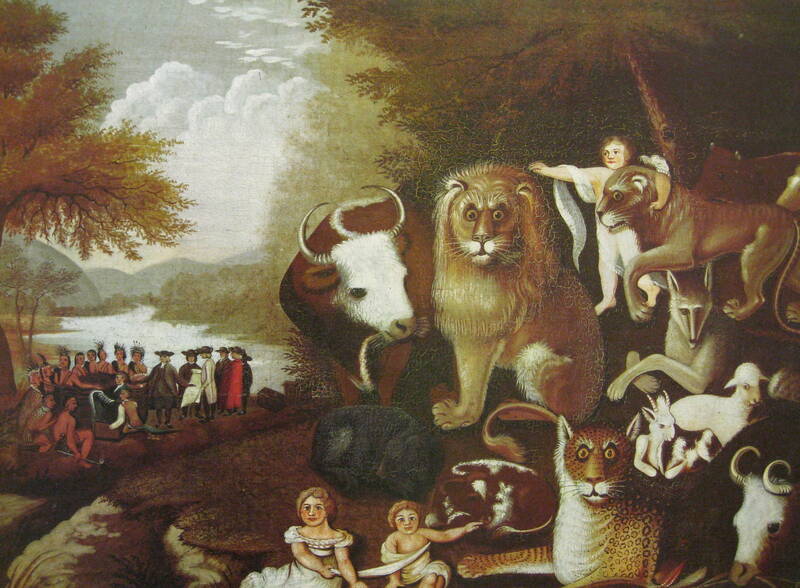 This scene depicts hope for a peaceable human kingdom. This painting is a make-believe fantasy. These animals would never get along peaceably together. They are natural enemies. The painting represents an IDEA. An idea is not as easy to picture as an object is. If I asked you to draw a picture of a house or a bird, it would probably be easier than if I asked you to draw a picture of HAPPINESS. Happiness is not an object; it is an IDEA and could be drawn in many, many ways. Each person’s definition for happiness might be a little bit different so his or her picture would be different too. Draw or paint a picture that expresses your ideas about the word HAPPINESS. 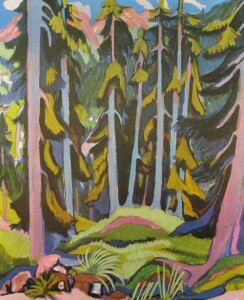 Ernst Ludwig Kirchner was born in Germany, in 1880. Ernst was an architectural student and first became interested in art when he visited the city of Nuremberg, Germany. There he saw some traditional German engravings, which inspired him to try etching. Eventually this led to painting. His painting was influenced by the Norwegian Expressionist, Charles Munch, and his interest in African and Oriental art. These influences caused Ernst to simplify the SHAPE and COLOR of his painting. He created large, flat areas of color (without shadows or highlights) that were often unexpected and unusual. The SHAPES of things he painted (people, trees, buildings, etc.) were very simple and unrealistic. Kirchner was an EXPRESSIONIST painter. In 1907, Ernst graduated from architectural school and moved to Berlin. While living in Berlin, between 1911 and 1914, he painted his most famous pictures. Being a German citizen, Kirchner enlisted in the German army during WWI. While serving in the army he became seriously ill. A year later he left the army and Germany, to move to Switzerland because he thought it would help him regain his health. While he was living in Switzerland, Ernst began to paint the mountain landscapes of the Swiss Alps. For many years he continued to suffer from poor health and to live in Switzerland, where he died in 1938. The artist has chosen some unusual colors to paint in this forest. We would not usually find these bright shades of pink, purple and blue in nature. What COLORS did the artist paint the tall tree trunks in this Landscape? Even with their unusual COLOR, can you still tell these are trees? When we look carefully, we can see that this color is really the mountains BEHIND the tops of the trees and not the trees themselves, which OVERLAP the mountains. Can you find the Brook? You will need to look very hard to see bright blue LINE that curves across the FOREGROUND, near the road of path. Take a look at the far left side of the picture. Can you see the buildings? They are only suggested shapes of color on the hillside below the mountains. When you first looked at this painting could see all the things we just talked about? Often, people never take the time to REALLY LOOK at the details of a painting. Sometimes people might look quickly at an EXPRESSIONIST painting like this, because the unusual colors make them think it isn’t really a picture. Is this painting really a picture? 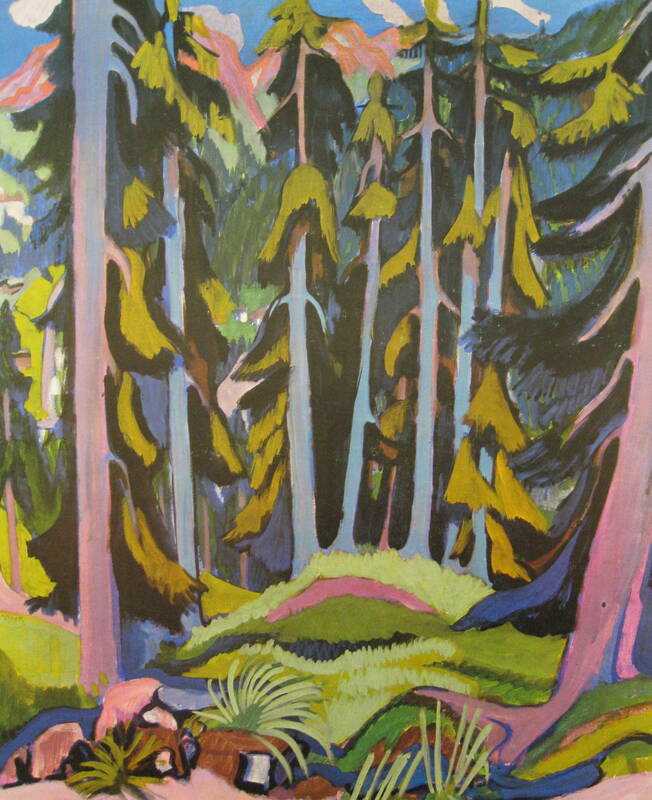 Use unusual and bright, expressive colors to paint an EXPRESSIONIST forest LANDSCAPE. Joan (Wahn) Miro, the son of a watchmaker, was born in Barcelona, Spain, on April 20, 1893. He enjoyed drawing as a boy. 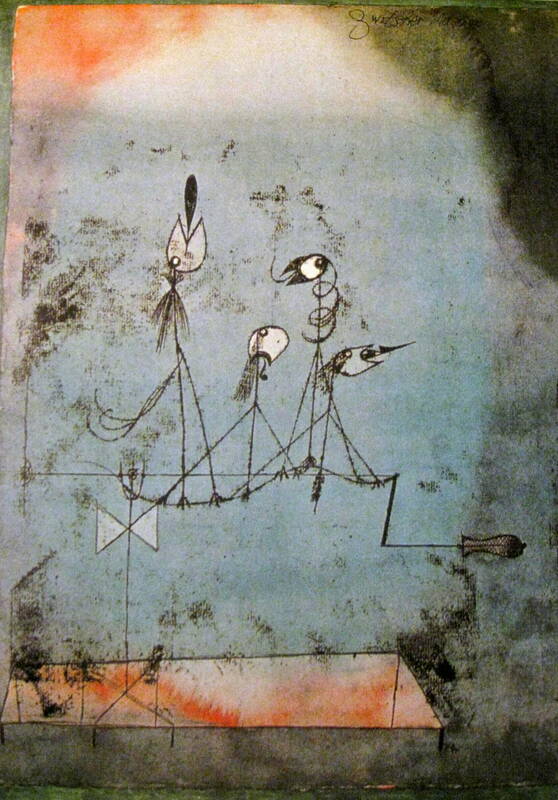 As a young man, Miro took classes at the La Lonja School of Fine Arts. His father persuaded him to also take business classes; at the age of seventeen Joan graduated, and began his job as a bookkeeper. Working as a bookkeeper led to a minor nervous breakdown, followed by a bout with Typhoid fever. This finally convinced his father that he was not suited for business and office work. Miro’s father eventually agreed he could enroll in additional art classes but his father hoped Joan would eventually learn a skill to bring in a more dependable income than that of an artist. In his father’s eyes, the life of an artist would cause his son to always live close to poverty. 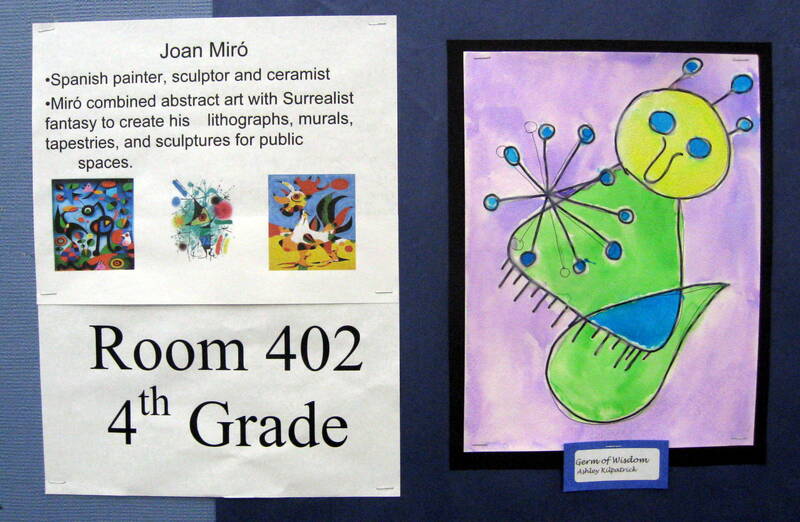 Joan Miro eventually became a very successful and famous modern artist. Miro died on Christmas day, 1983, and was buried in Barcelona. The style of artwork that Miro is most famous for is Surrealist and Abstract, although it is really in a category of its own. Joan Miro painted several paintings with sun symbols. Miro always depicted the sun as a red circle. He never painted the sun yellow, or with rays extending from it, which is a usual symbol for a sun. He painted his sun in an untypical way but he always painted it the same—a red circle. The way Miro typically painted people and animals was very strange. Sometimes they resembled stick creatures and sometimes they were more like blobs of color. Is this painting realistic? 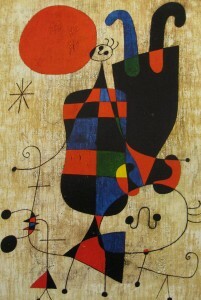 Miro’s people and animals are often abstract, just as in this painting. How many colors did the artist use? Red, blue, green and yellow—the entire background is a neutral beige or tan. There are black contour lines (outlines) and some black shapes but black and white are not really colors. Do you see any texture in this painting? The background has texture. How would you describe the texture? Where do you see curved line? Can you see geometric shape (circle, triangle, square)? Organic shape (people, animals)? Free-form shape? This painting is kind of a mystery. Miro never explained his paintings and he often chose titles that were hard to understand. He wanted his art to make people think, then think again. He also felt that everyone would explain his art in his or her own way. Some people think that his art defies explanation and that it is not really art at all. 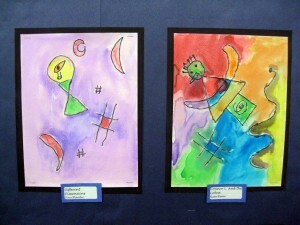 Miro decorated the canvas with bright shapes and colors that encouraged creativity and creative thinking in the viewer. He did not feel that there was only one way to understand a painting, but many ways. 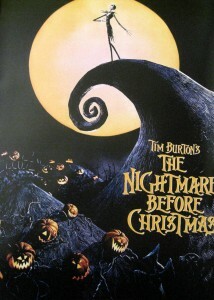 This poster is a copy of the original painting. The original painting sold for thousands of dollars. Would you pay thousands of dollars for a painting like this if you had a lot of money? Do you like this Abstract style of painting? Why or Why not? Have everyone think quietly to themselves about this question for a couple of minutes before they answer. All answers are valid as long as the opinion is backed up with a reason that shows some thought. Create a sun picture in the style of Miro (a red circle and at least one star created with lines). Use GEOMETRIC SHAPE combined with FREEFORM SHAPE and various LINES, to create people and animals in the picture. Use only black, red, yellow, blue and green to create your picture—the same colors Joan Miro used for his sun picture. Paul Klee (clay) was born in Bern, Switzerland, on December 18, 1879. When Paul was a boy, he was constantly drawing. He learned to play the violin at the age of seven and continued to play this instrument throughout the rest of his life. Music was important in his life. Paul’s father was a music teacher and his mother was a singer, as well as an amateur painter. Paul did very well in school and, in 1898, he began his art career by studying at the Munich Academy. After a few years, Paul traveled to Italy, where he studied the great classic artists, and then returned to Munich. Klee taught painting at the Bauhaus and published several books about art. Klee had an abstract artistic style in which he made objects look different in his paintings from the way they appear in real life. He loved color and sometimes only painted colors and shapes in his pictures. In all of his artwork, Paul changed the natural look of things and gave his pictures a feeling of energy, movement, and rhythm. This movement and rhythm reflected his musical understanding and talents. Through the years, Klee’s style changed as he tried new ideas. He experimented with many painting surfaces and mediums (art materials). Sometimes Paul painted on rough cloth with one kind of paint and then covered this with a totally different type of paint. Chalks, paste, and crayons were applied to paintings to give colors a special glow. Paul also explored the use of pen and ink. As he grew older, he painted with darker colors and the titles of his works became more serious. 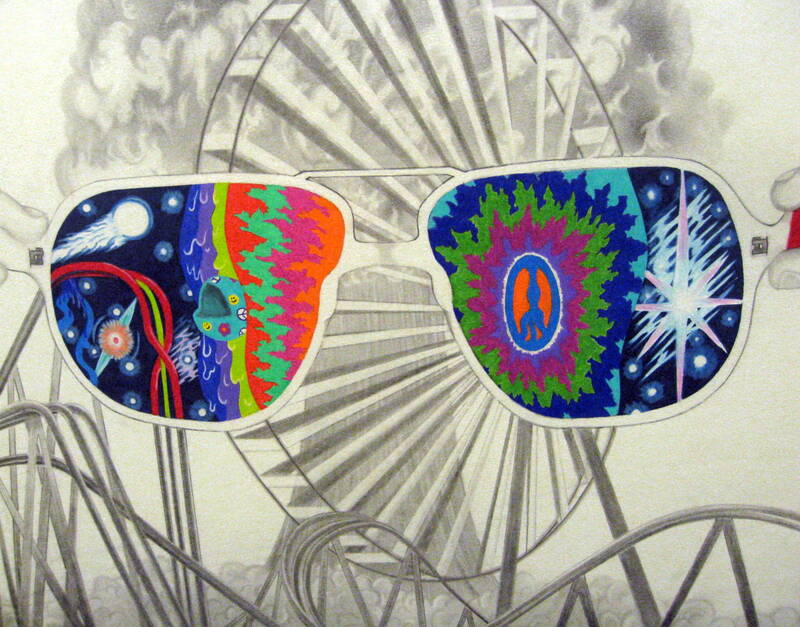 But Paul’s artworks always reflected his sense of humor and his love of fantasy and make believe. When Paul Klee died, in 1940, at the age of sixty, he had created over ten thousand drawings and almost five thousand paintings throughout his lifetime. Paul’s sense of humor reflected a light-hearted affection for the absurdities of life through his paintings. 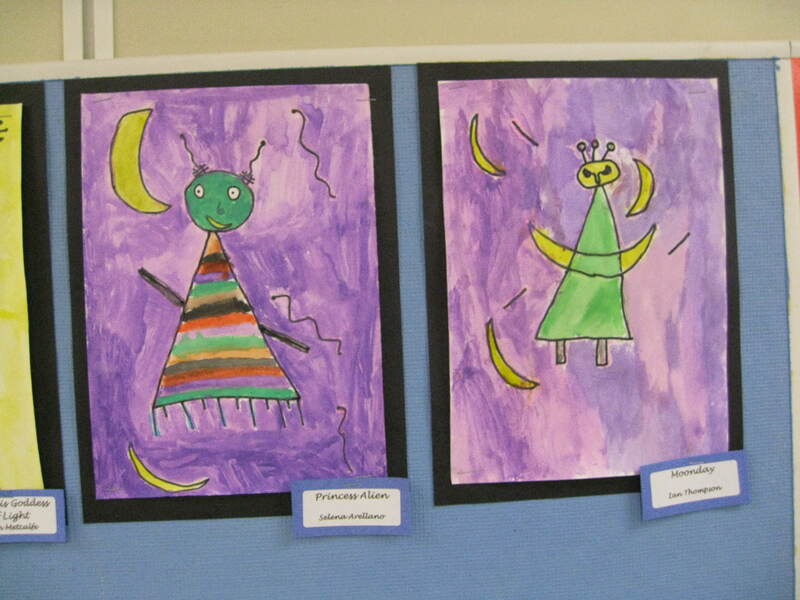 Klee liked painting inanimate (non-living) objects that suddenly come to life! Revolution of the Viaduct is one example of this. A viaduct is a bridge over a valley for a road or a rail. The ancient Romans were the first to use viaducts and they are found everywhere in our landscape today. Viaducts support the highways that carry traffic above our city streets. They bridge rivers and stretch across deep valleys. The arches (viaducts) that hold up these roads and bridges are sometimes high and narrow and at other times short and thick. They stand still and solid as cars flash with movement overhead. We trust these supports as we drive over them every day and expect them to stay in place as they perform their job. So, it is surprising when viaducts suddenly begin to move and take on a life of their own! 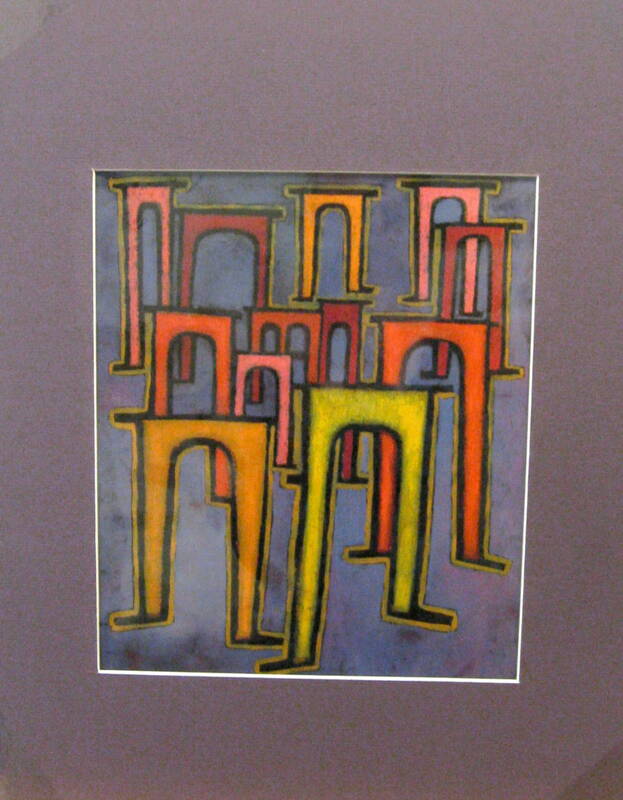 In this painting, Klee has created colorful concrete columns that seem to be walking legs. These viaducts have left their orderly, fixed rows and are walking around in a brightly colored group, as if they were unattached legs in colorful tights. Some are tall and thin and others are short and stocky. Although they have no heads or hearts, these viaducts are suddenly alive and seem to have a personality. 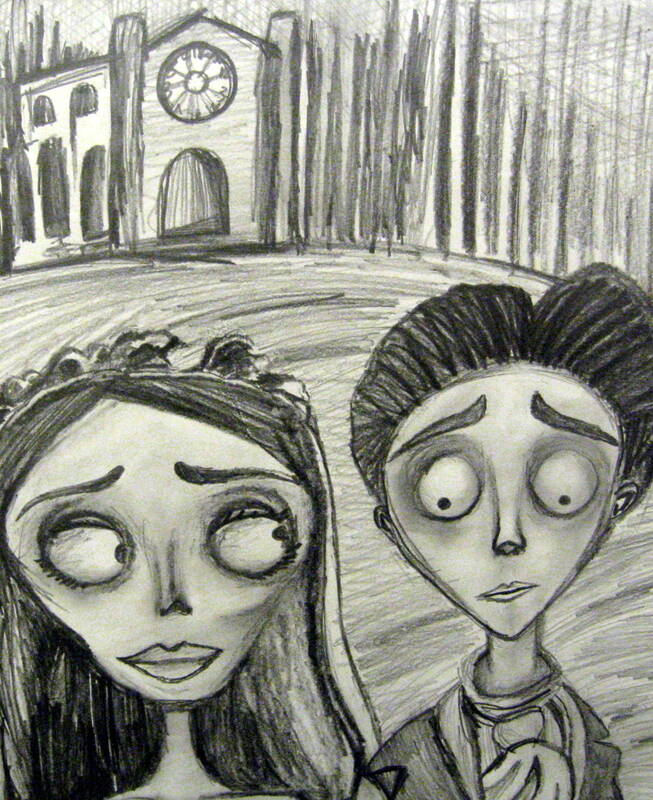 The artist has turned them into something new, startling, silly and fun! 5. 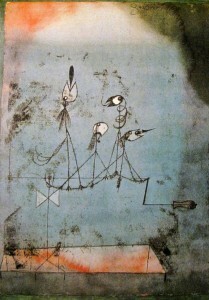 “Twittering Machine” by Paul Klee (clay). Watercolor, Pen and Ink (1922). Sometimes Paul used interesting titles to make his paintings more fun. How else could you possibly describe four birds, with their beaks open to the sky, perched on a wire, attached to an unsubstantial crank, than as a “Twittering Machine”? Klee loved to show happiness and fantasy in his work. He admired pictures drawn by children. As a grown-up, Paul tried to recapture the imagination of his childhood. 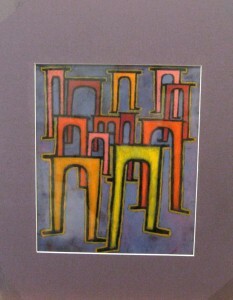 Many of his pictures are colorful and filled with interesting lines and shapes that had a special meaning for him. Can anyone describe the NEGATIVE SPACE in this painting? What are these funny looking stick creatures? Unless you tell kids the title of the painting, many ideas are possible. If they do not already know, tell them the title after you allow a few opinions from the class. The most elegant bird is the tallest one. Can you see its long flowing tail and draping, elegantly long neck feathers? We often recognize types of birds by their songs. They use their notes to let the world know how they feel. This painting might represent the many different sounding songs that birds sing. Notice the heads of the birds. No two are in the same position. Just as in real life, each bird is chirping its own song. Each bird is saying something special. The little bird beside the tall bird seems tired of singing. This bird’s head is drooping, and only a weak curl, or curving LINE of notes comes from its beak. From the bird on the right, a sharp, shrill sound is released. This bird might be angry about something. The next bird knows it can’t be heard above the noise of all the other birds, so it just chirps a soft song, waiting until later to sing loudly. For what purpose do you think this fascinating invention was made? Challenge the kids to get inventive and come up with a few creative suggestions. How many ways can you say the word chirp? Can you say it Loudly? Softly? Sadly? Excitedly? Rudely? Fearfully? Happily? Nervously? Frighteningly? Angrily? Calmly? Tiredly? Did you ever think about what it might be like to have only a few words you could use to tell others about all of your thoughts and feelings? Can you see any DIAGONAL LINE? Where do you see NORIZONTAL LINE? Is there any VERTICAL LINE? CURVED LINE? ZIG ZAG LINE? All 5 basic line types can be seen here. What do you think about the bird’s perch? Does it seem secure? No, the horizontal line the birds are sitting on seems as if it could bend and collapse at any moment. There are no supports on the far right side. This horizontal LINE QUALITY is extremely thin. All LINES in the picture seem thin, fragile and weak. Are these birds REALISTIC or EXPRESSIONISTIC? They are make believe and expressionistic, even abstract. The artist has changed the look of the birds so they appear comical. How did you know these little creatures were birds? The only way to really tell is by the title the artist gave the picture. Rube Goldberg was an American cartoonist that liked to make fun of America’s fascination with gadgets. He would draw imaginary inventions that were designed to accomplish a very simple task, such as swatting a fly, in the most complicated way possible. A twittering machine is the type of invention that Rube Goldberg would have enjoyed—a totally useless, silly invention. Draw and design an invention in a complicated and silly “Rube Goldberg” way. What about redesigning a can opener? Vacuum cleaner? Blender? Car engine? Washing machine? Be sure to add color to your drawing. 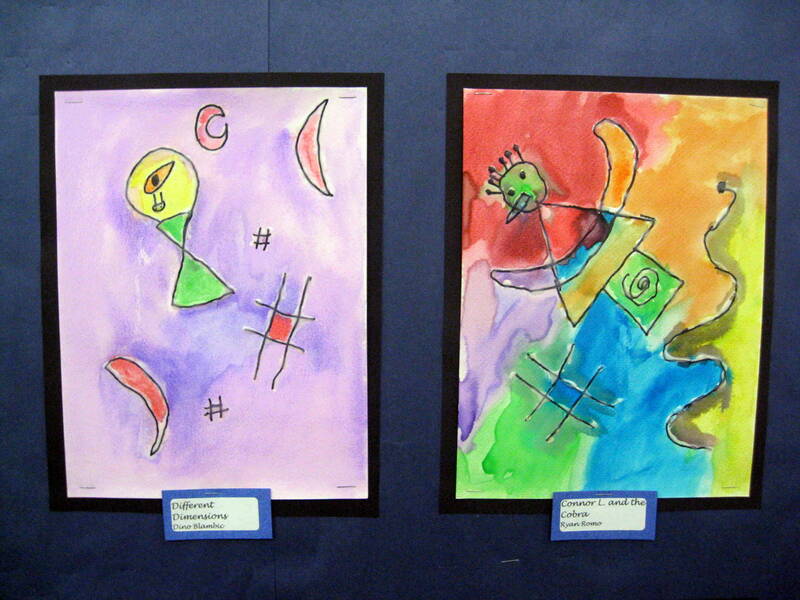 Design and draw a Meowing Machine, Barking Machine, or Chattering Machine in the same style as Paul Klee. Add color and dark CONTOUR LINE (outline). Cover an entire piece of paper, edge to edge, with watercolor. While the paint is still wet, sprinkle with a little salt and let it dry to create an interesting effect. Using only LINE, create an abstract group of creatures standing in a line. Do not make them appear realistic. Try to create a comical scene, like Klee. The creatures should be so abstract that it is hard to tell what they are, like in this example. Create an imaginative title that gives the viewer a clue to what the abstract creatures really are. 6. “Sinbad the Sailor” by Paul Klee (1923). Klee grew up in a very musical family. His father was a music teacher and his mother was a singer. Paul learned to play the violin when he was very young and was very good at it. Paul always loved to draw. When he was little and could visit his uncle’s restaurant, Paul imagined all kinds of interesting things in the RANDOM PATTERNS found on the marble tabletops there. He loved to trace what he saw on the tabletops onto paper. Now that you have seen some examples of Klee’s art, what do you think the artist meant by that statement? This ABSTRACT painting is a battle scene. The artist has not clearly defined SPACE in the picture. We are at the bottom of the sea and floating on the surface at the same time. The stylized water is presented in squares of various color values. Besides the neutral color black, are there more WARM/COOL COLORS in the painting? Sinbad the Sailor is a mythical person and the stories about him are full of magic. 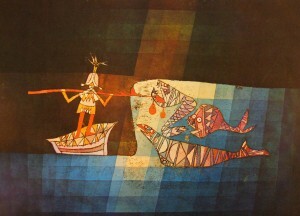 In Klee’s picture, we can see that Sinbad is harpooning a fish, but neither the man nor the fish look real. That’s because the artist was painting a fable, a fairy tale and not a real battle scene. Look at the three fish. Although each one is different, the PATTERNS of their scales match each other. Point out how the PATTERN on Sinbad’s shirt and the PATTERN on his boat are similar. Did you ever hear of a sailor who painted his boat to match his clothes? This one did! Notice how the sea changes color as your eyes move from one square to another. Klee carefully graded his colors from deep blues and browns at the edges to light blues and white at the center. This suggests the rise and fall of the waves and how the color of the ocean changes all the time. Pass out pieces of paper with a different squiggly LINE that you have lightly drawn with a pencil on each one. Kids can turn their papers in any direction to use the line that you drew to create an ABSTRACT picture—a person, an animal, or a landscape. Paul liked to trace the lines from the marble tabletops of his uncle’s restaurant and turn them into a picture in the same way. He explained that his drawings “took a line for a walk”. Tell kids you can hardly wait to see what kind of interesting walk they can create with LINE for this project. “Summer” by Francesco Zucchi (1562-1622) ? Though we are not sure this painting was done by Zucchi, we do know that the painter was influenced by the works of Arcimboldo. Giuseppe Arcimboldo was an Italian painter (1526 or 1527 –1593) best known for creating imaginative portraits made entirely of such objects as fruits, flowers, fish, vegetables and even books. Therefore the paintings were these items, simply arranged as a person or a figure. These paintings are very well liked, and in fact, you may find some of the art works of Arcimboldo in the Louvre museum in Paris, France, very near Leonardo da Vinci’s Mona Lisa. 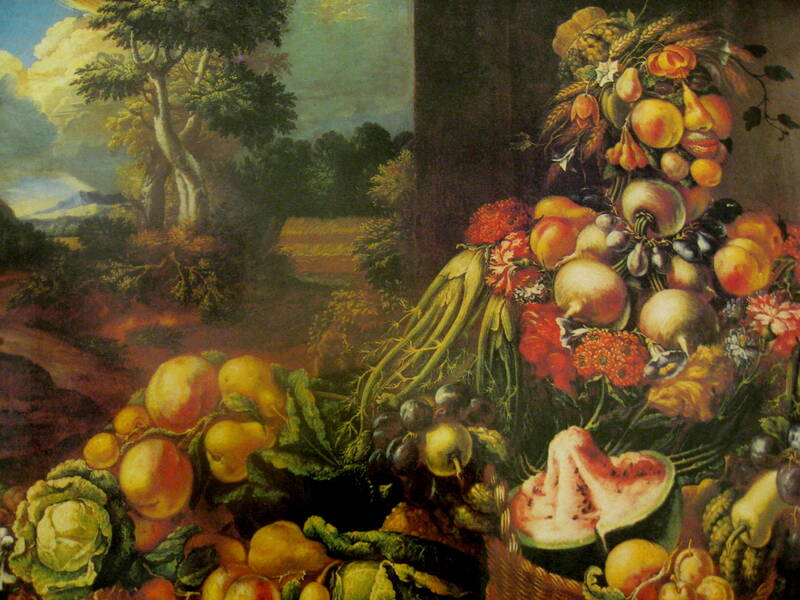 Arcimboldo’s famous works usually had very dark, plain backgrounds. This art by Zucchi takes the ideas of Arcimboldo to a new level by placing this “figure” made of fruits and vegetables in a sunny summer landscape. The placement of the person in the landscape makes the art work look even more like a commissioned portrait by perhaps a rich European country gentleman, which makes the art work yet more entertaining. These types of art works were simply clever optical illusions and made for entertainment and ingenuity. These are works are not meant to be taken seriously, however they do involve some seriously great artistic skills and imagination. What do you think of when you see this art work? The students might already be familiar with this type of art – enjoy their comments! Some students might be reminded of the art of Bev Doolittle that they may have seen in the last year or two. Help them to make connections like these! Some of Bev Doolittle’s camouflage techniques (although using rocks, trees, leaves and horses) may seem similar to those of Arcimboldo and Zucchi. Can you make an animal out of a leaf? Or a person out of objects found from nature? Make a collage of leaves or twigs or an animal out of pieces of fruit (or drawings of pieces of fruit). Draw two pears leaning towards each other and give it a title such as “Mother and Child.” These projects are great for using your imagination – or getting your viewers to use THEIR imaginations. Francisco de Goya (1746-1828) was a Spanish painter and printmaker. His full name was Francisco José de Goya y Lucientes but like many famous artists, you really only need to know the one name he is most known by: Goya (GOY-ah). Goya was the court painter of Spanish royalty, so he painted many portraits of the royal family in Spain. Goya is not only considered to be the last of the Old Masters, but also the first of the moderns. He created art that is important to history, and documents our human strengths and frailties. Goya was one of the most influential artists of his time, and is an important artist to study. Goya suffered a stroke which left him unable to paint. Goya therefore turned to creating small prints of a rather dark and bitter nature. We can understand his state of mind better because the prints are accompanied by comments. They are rather dark – so this art might not be appropriate for K-2. “You Won’t Escape” is one of 80 etchings and aquatints from Goya’s series Los Caprichos (Caprices). The Title “You Won’t Escape” is accompanied by a comment from the artist, “She who wants to be caught never escapes.” The art shows a pretty young girl who is surrounded by very creepy flying creatures. Why does she look happy? Goya’s art contains a moral, and it seems that the creatures might represent possibly bad habits or choices and the lovely lady is enjoying their company. The moral might be: if it seems like a bad idea and looks like a bad idea…it IS a bad idea. The viewer may want the young lady to escape and might be confused by why she is dancing playfully with these unsavory characters. Why isn’t this print in color? 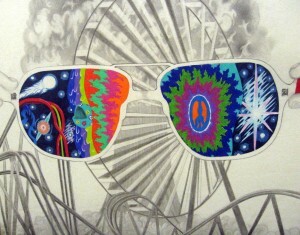 This art work is an etching, and hundreds of prints of it were made. The etchings were small and in black and white only. What was the artist trying to say? This is a morality art work – Goya might be saying, “just because you are pretty does not mean you are smart” or “make good choices” or possibly “don’t be friends with bad characters.” All answers or discussion is good. The artist was going through bad things and so he expressed himself in an angry way. Students have to make choices every day like everyone and your choices make a huge difference. To make a project that looks similar to an etching, start with a sketch and then go over the lines with a fine point black pen. Try using buff or manila or light brown card stock (vellum) paper which most schools have in their paper rooms. Use many small lines or cross-hatching for shading and try having a bright subject in the center and shade the background to give your subject contrast and highlights. Since the creepy figures look like owls or bats, maybe consider drawing animals in the style of Goya. Have the students do a drawing with the opposite theme: “I can escape” that shows them making great choices and running away from a bad idea, or just a positive image in the style of Goya. René Magritte (1898-1967) was a Belgian surrealist painter. Magritte painted witty (funny and clever) art works that make you think about how you look at things and maybe even how you think about what you see. Magritte is most likely testing our expectations: what would be the least likely item we could use to hold up the famous leaning tower of Pisa? The artist chose to show a giant feather. Surrealist art challenges our expectations of daily life and the laws of science. Do not look for this art to make sense and in fact perhaps invite the children to look at this art as showing things that do not try to show reality but are simply for visual interest, to invite us to think “What if…” and to have fun. Consider that the artist is looking for us to be surprised and possibly stunned and maybe a little bit frustrated by these things that are not supposed to exist in this way. Magritte painted flying birds made of stone and walls that should be dark but are instead the night sky to question our expectations of what is real and what is possible. What is going on in this picture? The Leaning Tower of Pisa is being held up…by a giant feather? Is the background realistic? No — the background looks like huge smooth stone or concrete steps or blocks that are impossibly huge…maybe behind a desert or some desolate place in the middle of nowhere. The actual leaning tower is the bell tower of a cathedral in the town of Pisa, Italy. It is in a grassy field and has buildings around it…but in your mind maybe does it exist all alone in a desert??? If you did not know it was built in a town then… Have a fun conversation about this interesting art work! 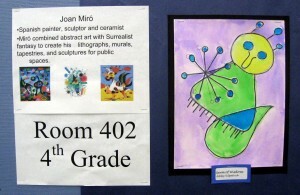 Ask the students to draw or paint two objects that could not possibly exist together! First the students will have to think of opposites or use their imaginations to create a funny situation that contains one object that is way larger than it should be. If the student is having a hard time thinking of what to draw, ask them what they like to draw and then encourage them to start with something that is familiar and go from there. 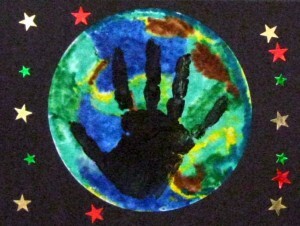 Use oil or chalk pastels on black paper and draw a normal household object…floating in space above the Earth. What if a butterfly or an ant was an airline pilot? What if a famous person was your school bus driver or what if the substitute teacher was a pirate?? What if …or….what if…. 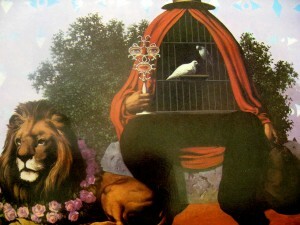 Magritte painted a scene with a man sitting by the side of the road with a birdcage instead of a body, sitting next to a lion wearing roses around its neck. There are many unexpected things about this art work. 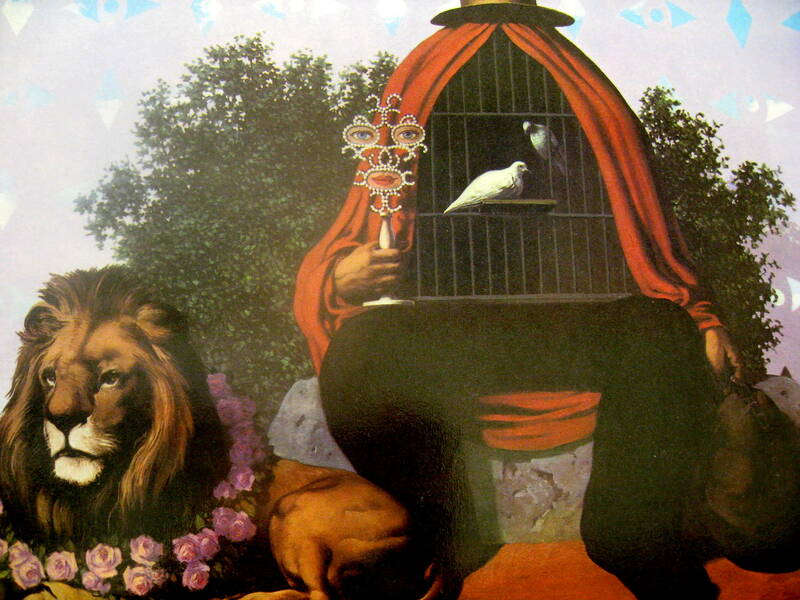 Each item itself is painted in a realistic fashion, as you can tell that the lion is supposed to be a lion, and that the man has placed his hat upon his…birdcage. Magritte made several versions of this interesting figure. This version was created as one of a series of 8 paintings for a mural for a casino in Belgium. There are symbols in the painting that might mean something (the “face” that the man is holding is in other Magritte artworks entitled “Sheherazade”) but the art work as a whole defies explanation. Why do you think the artist painted this picture? The answer could be, “Why not?” We might never know what an artist is trying to say and it is OK to guess and to not like the art! We don’t have to “like” all the art…just talk about it and try to understand why it was created. What was the artist trying to say? This is a thought-provoking art work – and very strange! The children might think it is very fun or just possibly be mystified. We don’t really know what Magritte is trying to say – just trying to get us to think. Invite the students to create a drawing of some realistic items with absurd elements. A good example might be a Still Life such as a bowl of fruit, in the middle of a lake or a highway. Another example might be: a child in their pajamas, asleep, on the school playground. Maybe a drawing of an office worker at a desk in the middle of a forest – the possibilities are as endless as the students’ imaginations! Because the drawings might take some time, ask the teacher if the students might be able to do shading, details or color with colored pencils later if time runs out.